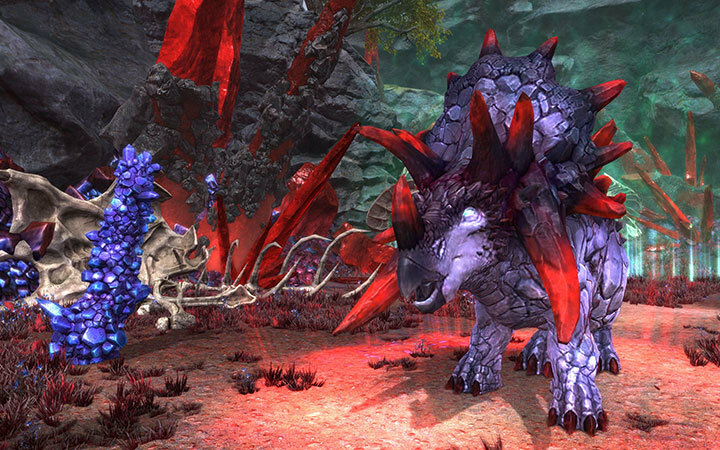 RIFT, everyone's favorite MMO that could, is adding a new dungeon in patch 3.4. It's a really cool kind of red crystal on muddy brown type setting, which is neat and it has crab monsters which is my favorite thing. Venture forth from Shal Korva and enter the fearsome Rhaza’de Canyons, battling your way through them to reach an encounter for the ages. Read on to learn more about this exciting dungeon, coming in RIFT 3.4: Into the Wilds! Below Shal Korva lies an immense network of canyons containing the ruins of fabled Rhaza’de. Within these steeply sloping walls, Teth Mornta has corrupted the mighty Ascension Machine, using it for fell purposes. You know you want to fight some of these giant enemy crabs here, so get excited for RIFT 3.4. Well, I went back and looked and they're more giant enemy dinosaurs than crabs. I really kind of wish there was a game where literally you just fought crabs. I think crabs make great bosses, because you've got that claw action going and then they can also bite, plus they have an excuse to be nearly as mobile as they are. I want to say that is one kind of dinosaur, but I feel as if that dinosaur names have changed so much since I was a kid, that I really don't even wanna try. Anyway, if you want to spoil the dungeon, there is a full detailed walkthrough of what the dungeon is like on the official site.